Today’s technology leaders are charged with securing and protecting the customer, employee, and intellectual property data of their companies in an environment with increasingly complex security threats. As cloud computing has become more widely accepted, a number of information security concerns have been raised. In a computing context, security comprises cybersecurity and physical security — both are used by enterprises to protect against unauthorized access to data centres and other computerized systems. Information security, which is designed to maintain the confidentiality, integrity and availability of data, is a subset of cybersecurity. In the following section, we will be covering on how AGHRM handles the security for each of these layers. Below is a high-level representation of AGHRM applications. a. Web – Customers will be using AGHRM applications via one of the web servers. This set of servers will be running MS IIS as well as AGHRM suite of solutions. b. 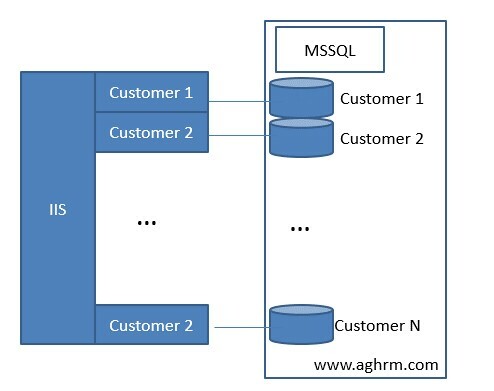 Database – Stores AGHRM’s customer data. Runs MS SQL Server. Below are the key considerations for AGHRM’s application security. • Authentication – All passwords are encrypted with a cryptographic hash function and a secret cryptographic key. All authentication requests are performed using a one-way hash to ensure the security of the passwords. • Authorization and Access Control – AGHRM is a role-based system with 3 main roles. o Employee – User can only view/manage his/her own records. o Manager – User can only view/approve/reject requests from his/her own team members. o Administrators – User is able to configure policy as well as manage transactions. Can be restricted by module and companies. • Session Management – Users are automatically logged out of the system if they have been idle for more than a specific period of time. The typical timeout period is 20 minutes. However, this setting can be changed at a per customer basis. • Command Injection Flaws – All data input fields are validated by AGHRM for Cross Site Scripting as well as Command injection attacks by default. Confidentiality refers to protecting information from being disclosed to unauthorised parties. For shared hosting, multiple customers are hosted within the same server. Each customer has a separate portal linked to a separate database instance. This approach ensures that each customer’s data are physically stored in a separate database and there is no possibility of customers accessing other customers’ data. Below is a logical view of our data segregation model. For dedicated hosting, only 1 customer will be hosted within 1 server. Integrity – protecting information from being changed by unauthorised parties. Users access AGHRM via the internet protected by Transport Layer Security (TLS). This secures network traffic from passive eavesdropping, active tampering, or forgery of messages. Availability – to the availability of information to authorised parties only when requested. User can only access AGHRM’s portal upon successful logins. AGHRM host our servers with global hosting partners like Amazon Web Services and Microsoft Azure. You can find the data centre certification compliance in the URLs below. Access to the server is tightly controlled. • For web servers, only HTTP and HTTPS ports are open to the public. • For database servers, only SQL connection is accepted from authorized servers. 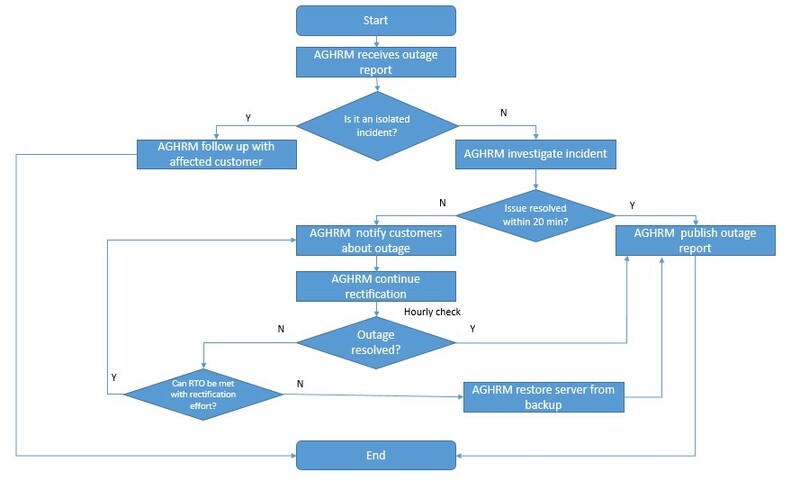 The objective for Business Continuity Planning to document down AGHRM’s processes to ensure that our customer is able to operate our systems with minimal disruption to their operations. 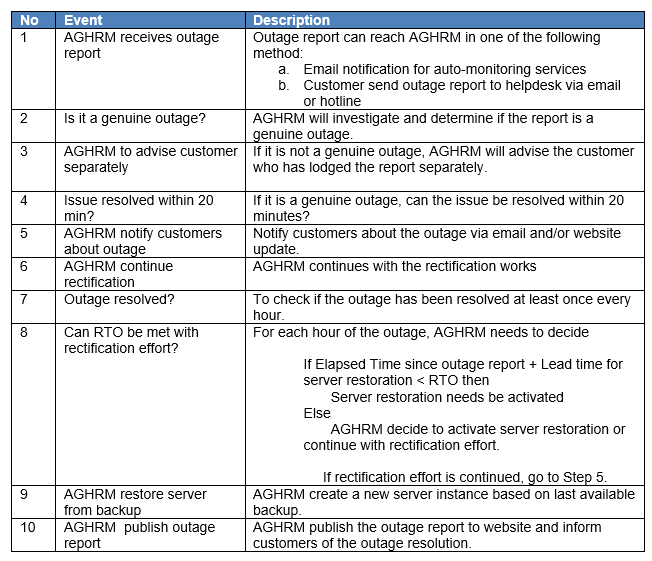 Below is an overview of AGHRM backup policy. a. A backup image of the production server is done every 24 hours. 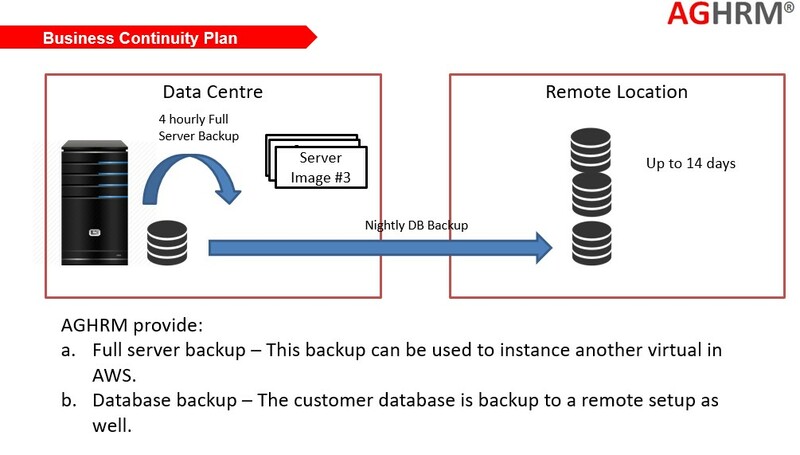 These backups are then stored in a separate data centre from the production servers. b. On a nightly basis, the customers’ database is also backed up and stored in a remote location. Below is the process flow during outage incident. AGHRM provides password policy tools to help organizations enforce their IT security policies.